We have several ways for you to DONATE to the Foundation while shopping that will provide a free donation to the charity. iGive.com is one, just go to www.iGive.com/wmsbcf and download the browser and their BUTTON and then every time you do a search or make a purchase at any of the 1600 listed stores they will send a percentage of your purchase to the foundation FREE. Select the Foundation if you use Amazon. 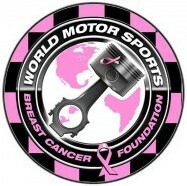 Go to and just sign up at: http://smile.amazon.com/ch/26-3483663 A percentage of your purchases will go to the Foundation. 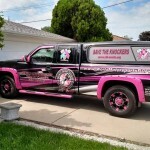 If you are a FACEBOOK member you can go to www.facebook.com/wmsbcf and select (Fundraisers) and create your own fundraiser. 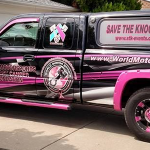 If you use PayPal you can select the Foundation by going to, www.paypal.com/us/fundraiser/charity/117748 Then every time you use PayPal you will be providing us with a donation, at no additional cost to you. This show will feature all the top muscle cars from around the USA for two days. 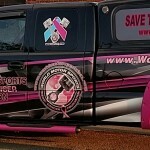 CHECK OUT THE PICTURES OF THE OFFICIAL WORLD MOTOR SPORTS BREAST CANCER FOUNDATION TRUCK. Find out where we will be on stk-events.com.